The bustle of the holidays are behind us and a new year stretched out ahead. It's hard to believe we are already halfway through January. We really did enjoy the long break with our boys and squeezed in lots of family time (some of my favorites were ice skating on Fountain Square, a day spent antiquing with Andrew looking for his annual nutcracker, snow tubing, Christmas movie watching and baking with Charlie). I tried to slow down and enjoy the season, tried to finish shopping early, not be over ambitious with my baking, to the keep the decorations minimal and meaningful. I think we can sometimes get lost in trying to make it all so special or fulfill every holiday activity we imagined, that we forget to be still and just savor the time together and let go of the unnecessary expectations we put upon ourselves. Each year I get a little better, a little more laid back with all the preparations and less wrapped up in the fuss. Now that a bleak winter lies between us and spring, I'm all about lots of cozy, candle lit dinners, mornings by the fire with a cup of tea, lazy Sundays reading good books, family game nights and baked after schools snacks with homemade hot chocolate. So, basically lots of eating and taking it easy! Ha! When it comes to buying a whole roasting chicken, I have had the best results with the Amish chickens sold at Kroger. The worst chickens I've had have come from Whole Foods. (sorry, but they tend to be a bit scrawny and dry.) Trader Joe's organic chickens are also very good and a little bigger than than Amish chickens. We do have a local farm that sells amazing chicken too if you plan ahead. 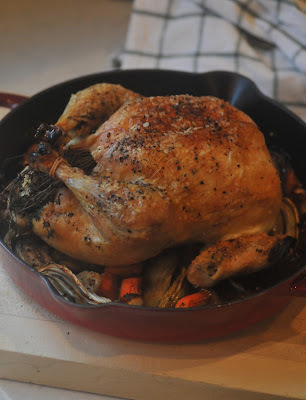 There are two ways I prepare a roast chicken - one is with a pan gravy and the other is with roasted vegetables. It just depends on what I feel like making. The gravy is excellent and probably the kids' favorite. I on the other hand, can never get enough vegetables when cooked with a roast of any kind so that version is mine. Remove chicken giblets. Rinse the chicken inside and out and pat dry. Remove any excess fat and left over pinfeathers (this sounds much worse than the reality). Place chicken in roasting pan, liberally salt and pepper the inside of the chicken. Stuff cavity with a bunch of thyme, both halves of the lemon and all the garlic. Brush the outside with melted butter and sprinkle with salt and pepper. Tie legs with kitchen twine and tuck wing tips under the body of the chicken. Scatter onion slices around the chicken. Roast for 1 and half hours. Remove to platter and cover with foil. Remove chicken giblets. Rinse the chicken inside and out and pat dry. Remove any excess fat and left over pinfeathers. Liberally salt and pepper the inside of the chicken. Stuff cavity with bunch of thyme, both halves of the lemon and all the garlic. Brush the outside with melted butter and sprinkle with salt and pepper. Tie legs with kitchen twine and tuck wing tips under the body of the chicken. Place onions, carrots, fennel in a roasting pan. Toss with salt, pepper, 20 sprigs of thyme and olive oil. Spread around the bottom of the roasting pan and place chicken on top. Roast for 1 hour and 30 minutes. Remove chicken and vegetables to a platter and cover with aluminum foil or about 20 minutes before serving.